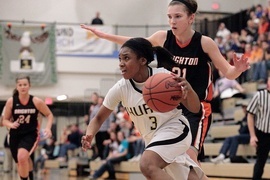 Posted on Thu, Mar 8, 2012 : 10:28 p.m.
FARMINGTON - Huron High School freshman Kamala Glenn drove through the lane and was fouled hard as she threw up an underhand layup. The ball seemed frozen in time as it hung in the air, finally dropping through the basket as the referee’s whistle blew. Glenn completed a three-point play to put Huron up 44-34 on Hartland with just two minutes, 33 seconds left to play in a Class A regional final at Farmington High School. The Huron fans in attendance began to celebrate what seemed inevitable at that point. But Huron athletic director Dottie Davis was curiously absent as the clock ticked down toward the River Rats’ regional championship, no longer seated behind the bench where she had spent the entire game. Huron senior Bianca Williams shows off her regional championship T-shirt. The players immediately threw the shirts on over their uniforms before accepting the school's first girls basketball regional championship trophy since 1995. The River Rats (20-5) will play Saginaw Arthur Hill (17-7) in a state quarterfinal on Tuesday at Grand Blanc High School. 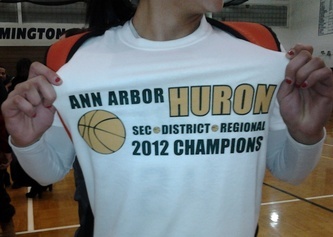 Davis had the shirts printed after Huron’s semifinal win on Tuesday, and she didn’t tell a soul. Especially not Huron coach Steve Vinson. Davis said she’s gone out on a limb and had shirts printed prematurely in the past that ended up being washrags for fundraiser car washes. The play of a couple of freshmen kept the shirts from the soap bucket on Thursday. Freshman Payton Sims led Huron with 18 points on 6-of-7 shooting night from 3-point range. Trailing 8-5 in the first quarter, Sims hit her second of two threes in the quarter and Huron never trailed again. It was just a week ago during district play that Sims saw a drop in playing time due to the play of Ariel Bethea. With Bethea out of the lineup on Thursday, it was Sims’ time to shine. Defensively, Huron’s focus was stopping Hartland’s primary ball handler, Bailee Maggert. Vinson rotated through four players to try to match the energy of Maggert, and no one was more effective than Glenn -- also a freshman. Glenn’s only points came on the scoop-and-score in the fourth quarter. It was clear that her primary responsibility on the court was to deny Maggert the ball. Huron led 22-14 at the half, but back-to-back 3-pointers by Maggert to start the third quarter made it a game again. It ended up being the only quarter in which Hartland outscored Huron and ended tied 29-29. Despite the surge, Palmer said he was concerned with Maggert and his team’s energy going into the fourth quarter. “I didn’t know if we could sustain it. They exhausted us,” Palmer said. Huron went on an 8-0 run to start the fourth, bookended by a pair of Sims 3-pointers -- the first one a bank shot -- and Hartland never was closer than five points again. "I honestly didn't think that one was going in," Sims said with a smile. "Shooter's touch, I guess." Maggert scored seven points for Hartland while Lindsey Pajot led the Eagles (21-4) in scoring with 13. Fri, Mar 9, 2012 : 1:25 p.m.
Dottie is a class act. Great AD. Fri, Mar 9, 2012 : 6:02 a.m.
Congrats Lady River Rats! Keep playing with your signature calm and consistency against Saginaw Arthur Hill. Glad Pete (the reporter) was at the game. But why wasn't a photographer there? If an Ann Arbor boys' high school team makes the regional finals, do you plan to send a photographer?